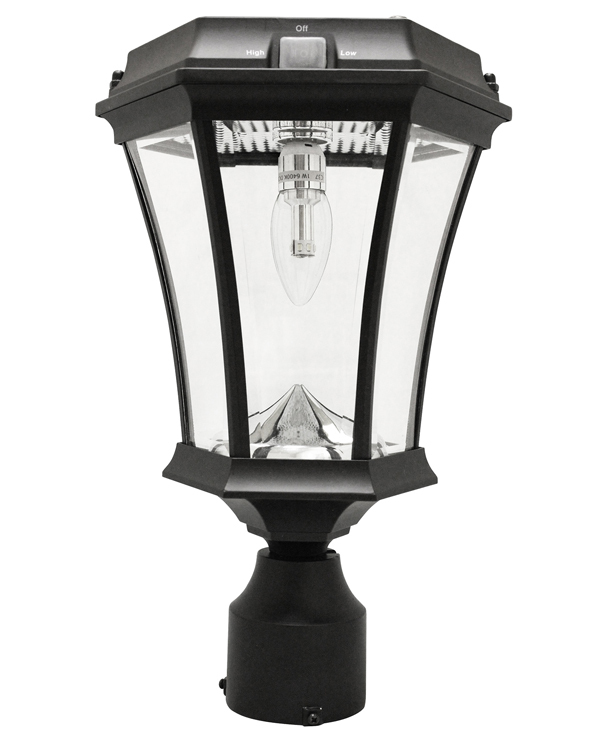 Like all of our Victorian Solar Lamp Posts, our new Victorian Double Solar Lamp Posts combine modern solar lighting technology with classic 19th century gas light design. 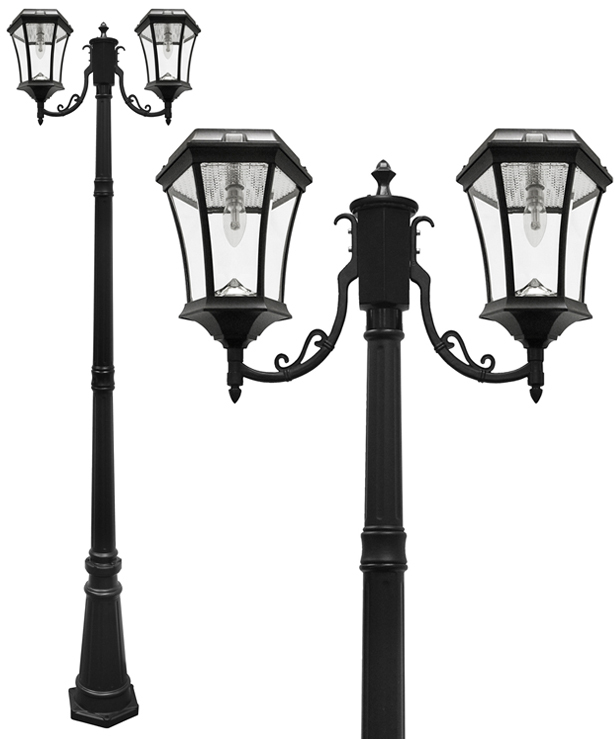 The new lamp posts, however, have smaller reflective cones and new warm-tone LED bulbs with a look more like traditional electric lamps. 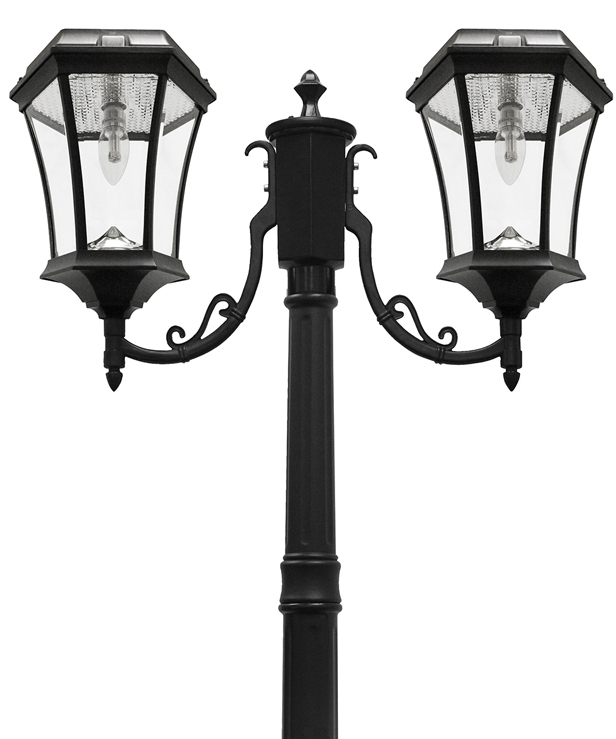 The Double Victorian Solar Lamp Post with New Bulb and Reflective Cone features two warm-tone solar lamp that is a stately 93 inches inches tall (lamp plus post). Available in black, the panes of the light are real beveled glass. The weather-tight housing is made of cast aluminum with a powered coated finish for chip and scratch resistant low-maintenance. Both of the lamps on this fixture have a new cone and LED with an exterior switch that lets you turn the light on and off easily or switch between high and low settings. At 180 lumens in the high setting per lamp (360 toal lumens), the light is similar to that of a 60 watt incandescent bulb. In the low setting, the light is about that of a 45 to 50 watt incandescent bulb. On a full solar charge, the light will run 10 to 12 hours.